More than half (12) threw four different kinds of pitches, seven threw three different kinds of pitches, and only Oliver Perez stuck with two pitches. Fourteen of the pitchers threw at least three pitches 10% or more of the time each (Escobar actually threw four pitches more than 10% of the time each). Danny Haren was the only pitcher on the list that threw three different pitches more than 20% each. Anyway, the point is that variety seems to be a hallmark of success. But we all knew that anyway - guys that only have two pitches usually end up in the bullpen. One thing that I find interesting is that the slider is the breaking ball of choice, instead of the curveball. 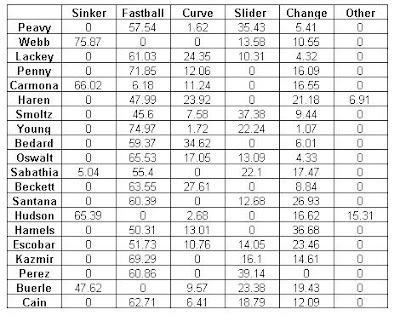 Eight of the pitchers threw a slider more than 15% of the time, while only five threw curveballs at least 15% of the time. Also, eight threw the curveball less than 5% of the time, while seven threw the slider less than 5% of the time (however, two of those, Haren and Hudson, both throw a cutter, which is listed under 'other' but could be considered a form of a slider). This preference for the slider makes sense from the standpoint that they are easier to control, but it is surprising from the standpoint that the slider might be the most damaging pitch to a pitcher's arm. Less surprising is the reliance on the changeup. Oliver Perez is the only pitcher that didn't throw any changeups and only four threw less than 5%, while nine threw more than 15%. This makes sense in that the changeup is the pitch that pairs up best with the fastball (which is the overwhelming favorite pitch to throw) and is the easiest on a pitcher's arm.